Last July, the Chicago Aldermanic Black Caucus gathered in the upscale Persona Lounge in the Loop for their annual fundraiser. Promoted on Facebook as a chance to “celebrate the summer season and raise funds for community scholarships,” the event did not go as smoothly as planned. Youth civil rights activists from several Chicago organizations arrived to protest the Caucus’s support of the Chicago Police Department and to express opposition to the planned $95 million police training facility on the West Side. An hour before the event, the Civilian Office of Police Accountability had released body camera footage of the police shooting of 24-year-old Maurice Granton Jr., who died when a bullet entered his back. “We’re here to have a good time; if you want to protest take it outside,” 34th Ward Alderman Carrie Austin told the crowd as security escorted a protestor shouting “No cop academy!” from the venue. Willie Cochran, then the alderman of the 20th Ward, took the microphone. “They must not know we got gangsters in here,” he joked, to a roar of laughter from his peers. Cochran’s comment may have been a joke, but the suggestion wasn’t as absurd as it may have sounded. In 2016, a federal court indicted Cochran on 15 counts, alleging that he stole charity funds, accepted thousands of dollars in bribes from businessmen seeking deals, and coerced a liquor store owner into paying him $3,000 in exchange for Cochran’s support of an ordinance affecting liquor licenses. On March 21, he pled guilty to a single charge of wire fraud, admitting to a federal judge that he used $14,000 of contributions to the 20th Ward Activities Fund—intended for community events for constituents, particularly children and seniors—to gamble, make personal purchases, and fund part of his daughter’s college tuition. In accordance with state law, Cochran resigned his position as alderman when he pled guilty. Mayor Rahm Emanuel’s spokesperson Matt McGrath said that the mayor does not plan to appoint a replacement, who would serve until the winner of the runoff takes office on May 20. Emanuel however, has not ruled out the move, and his office is “evaluating [their] options and will do what is in the best interest of the city and the residents of the 20th Ward,” McGrath said. Cochran will be the third alderman from the 20th Ward to go to prison since the 1970s. The 20th Ward, covering most of Woodlawn, parts of Washington Park, Englewood, and Back of the Yards, only has two peers in aldermanic corruption rates: the 23rd and 31st Wards. He will likely spend a little over a year in prison. In 1986, the FBI ensnared then 20th Ward Alderman Clifford P. Kelley as part of Operation Incubator, a probe of Chicago and Cook County corruption that produced 14 bribery indictments. Kelley, prosecutors alleged, accepted $7,500 from a con man turned FBI informant in exchange for expediting a private bill collection agency’s bids for lucrative City contracts while impeding those of their competitors. They also accused him of accepting a $6,500 bribe from a waste management firm, illegally soliciting a $10,000 loan, and failing to file three years of federal income tax returns. Kelley sought reelection in 1987 but lost and ultimately pled guilty to four counts of mail fraud and failure to file his tax returns for 1985. He spent nine and a half months behind bars. Arenda Troutman, the first female alderman indicted while still in office, served as 20th Ward alderman from 1990 until 2007, when Cochran won in the midst of her corruption scandal. During the race, Cochran emphasized Troutman’s violation of constituents’ trust and promised reform. Troutman was sentenced to four years on mail fraud and tax fraud charges. Aldermanic prerogative, the largely unwritten power of aldermen to initiate or block City Hall actions that impact their Wards, has been a major topic of debate both on the citywide and Ward levels throughout the campaign and election process. Though it doesn’t stem from any legislatively granted authority, members of the City Council, the mayor’s office, and citywide administrators responsible for land-use policies overwhelmingly respect this privilege. In most cases, if a development that requires a zoning change or permit lacks the support of the local alderman, the City Council can be relied upon to vote the measure down. Each alderman effectively holds the final say regarding developments planned for his or her Ward. This can quickly lead to aldermen making deals to enrich themselves illicitly and potentially at the expense of Ward residents—a phenomenon with which the 20th Ward is familiar. Absent sufficient oversight, aldermen often end up granting deals to those business owners willing to pay the most, and not those whose developments would most benefit residents. Proponents of the system, however, argue that it makes City Hall more responsive to Chicagoans’ needs by privileging the voices of those residents most closely affected by any given governmental action. Aldermanic prerogative can allow City Council members to reject developments planned for their Wards that are popular on the citywide level, but have potentially negative consequences for those living nearby—for example, Emanuel’s proposed City-owned casino. Not surprisingly, the issue of corruption featured prominently in the lead-up to the February election, in which nine candidates vied to replace Cochran. 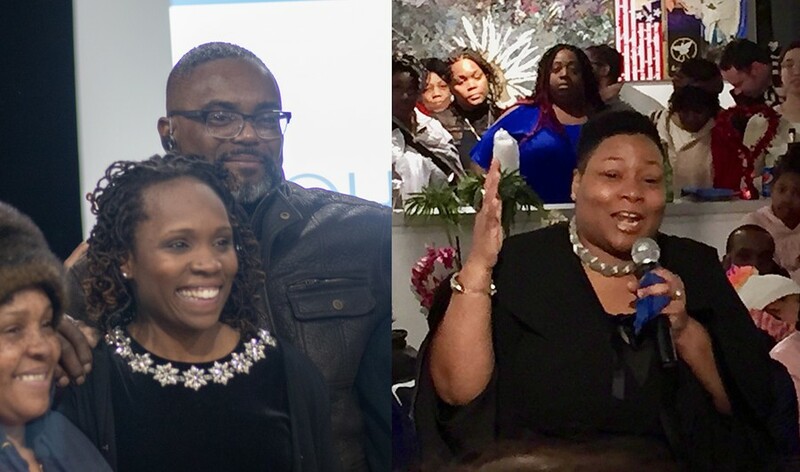 On April 2, voters winnowed the field to two candidates, Nicole Johnson and Jeanette Taylor. Both boast strong grassroots credentials and plans of reform, but will continue to grapple with the problem as they compete for votes in the runoff election. “People are getting more educated around it,” BYP100 co-chair Brown said. “People are looking for action plans.” Whoever wins will face the daunting task of rebuilding the community’s trust in its alderman and reforming the institutional failures that have allowed corruption in the past. Nicole Johnson, who finished with 22 percent of the vote in the February election, grew up in Englewood, and still lives there in a house that her grandmother owns. Her experience of “going to really good schools but knowing at an early age that that wasn’t the case for a lot of other kids” inspired her to become a public servant—first as a third grade teacher, and later through a career in public policy work. She has worked at a number of local nonprofits, including Teamwork Englewood and Chicago Votes, and was selected as a peer adviser for the Obama Foundation’s inaugural Civic Engagement Training Day. When I asked her if she feels that Cochran has served the people of the 20th Ward, she told me, “It depends on who in the Ward you’re talking about.” Voters from Woodlawn—comparatively the wealthiest part of the Ward—have told Johnson, “Oh, he’s done okay, he makes sure that we have block clubs and we get our permits, so, basic constituent services.” Things are different in the more impoverished areas of Englewood, Washington Park, and Back of the Yards. “When I’m in this part of the Ward though, people are like, ‘We just been completely forgotten about,’” Johnson said. Johnson’s campaign office, located in a storefront on Englewood’s South Halsted Street, sits next to a vacant lot; another lies across the street. At the nearby intersection of South Halsted Street and West Garfield Boulevard, a boarded-up building sports a colorful mural paying homage to the neighborhood’s history of blues music. There are parts of the Back of the Yards, she said, where “it looks like a forest. There’s nothing there.” Johnson also brought up residents of Washington Park who have to walk multiple miles to go grocery shopping and the poor quality of internet service in Englewood. “There’s a lot to be desired during his leadership in terms of just the basics,” she said. Woodlawn, the home of University of Chicago students who live south of Midway Plaisance, presents its own challenges. Fourth-year and 20th Ward resident Anil Sindhwani, who serves as policy and outreach coordinator for Johnson’s campaign, expressed concern over expensive new developments changing his block. “I know that the rents of the apartment buildings down the street are going up,” he said. Community organizer Jeanette Taylor, Johnson’s opponent in the runoff, led the field in February with 29 percent of the vote. She originally moved to the 20th Ward in 2013 when rising rents forced her to relocate from Bronzeville. It’s an experience that has fueled her activism. Having suffered the consequences of gentrification once, “I didn’t want the exact same thing to happen again,” she said. Two days after Taylor moved in, six-month-old Jonylah Watkins died after she and her father were each shot multiple times while he was changing her diaper in the family minivan. The tragedy made national news. Shaken by the shooting, Taylor went to talk to Cochran with her 10-year-old daughter in tow. “I went to his office and told him that I didn’t really feel safe in the community,” Taylor said. Cochran responded that she was being “too critical” for someone who had just moved into the neighborhood. Taylor echoed Johnson’s sentiment that Cochran’s office has benefited some but not all in the 20th Ward. “Back of the Yards, Englewood, New City, all feel like they’re left out,” she said. Brown of BYP100, who has worked on Taylor’s campaign, also doubts Cochran’s engagement with the community. His experience knocking 20th Ward doors in support of BYP100’s Community Benefits Agreement campaign heightened this suspicion. “A lot of people have said that they’ve never seen him, or they’ve only seen him once and that was on election day,” Brown said. Taylor agreed that Cochran has been largely closed off to constituents. “The alderman’s office is supposed to be a resource for the community and it hasn’t,” she said. Cochran, when contacted for comment, was unwilling to speak to Grey City at the time of publication. Taylor starts with humor when asked for assurance that she’ll stay out of prison. “I start off as light as I can,” she told me, joking that she doesn’t look good in orange and that the jail’s bologna isn’t up to her standards—“I like Oscar Mayer”—before getting serious. Taylor aims to foster a level of engagement and transparency that will make corruption impossible. The two candidates were the second-best and best funded contenders in the February election, respectively. According to Illinois Sunshine, Johnson’s top donors include former cannabis entrepreneur and philanthropist Peter Kadens, musician and activist Chance the Rapper, Duchossois Family Foundation president Ashley Joyce, and retired asset manager Timothy Schwertfeger. Taylor, on the other hand, has received most of her support from unions and progressive organizations. The Chicago Teachers Union (CTU), Service Employees International Union, and United Working families are her biggest backers. When I asked Johnson why she thought Taylor had received the CTU’s endorsement, despite Johnson’s own history as a member, Johnson said that the move was probably the result of a “backroom deal.” However, she didn’t elaborate on what such a deal might have looked like. Taylor also cited her involvement with the CTU’s push for Sustainable Community Schools, which offer smaller classes sizes and broader forms of community engagement to students and their families, implying that Johnson could not tout the same involvement. She said she was tired of telling people that she won’t apologize for getting the CTU’s support. “These are the same people that I’ve been fighting for for 10 years,” she said. Regarding her funding, Taylor told me that if elected, her first obligation will always be to the residents of the Ward. When I asked Johnson whether she thought the Ward was in for an improvement, regardless of the election’s outcome, she told me that “certain aspects” would definitely improve, but not all. Despite her differences with Johnson, Taylor was much more sanguine.